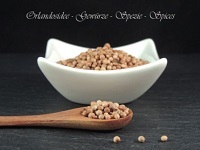 Coriander originates in Spain, but was also known and loved by the Egyptians. They found Coriander even in the tombs of the Pharaonen.The Greeks and Romans not only used Coriander as a Spice but also as medicine. The Coriander has a very fine and lightly sour taste similar to the peel of an orange. Coriander goes with seafood and rice. It gives the last kick to pepper sauces and marinades.Try it on a fresh pineapple or orange. To reach the full taste out of coriander heat it in a pan and grind it afterwards.